The cold stretching section consists of three rollers driven by two servo traction motors. Each set of rollers consists of two rollers, one is steel roll and the other is silicone roll. The preheating section consists of three rollers, each of roll is driven by a separate servo motor. 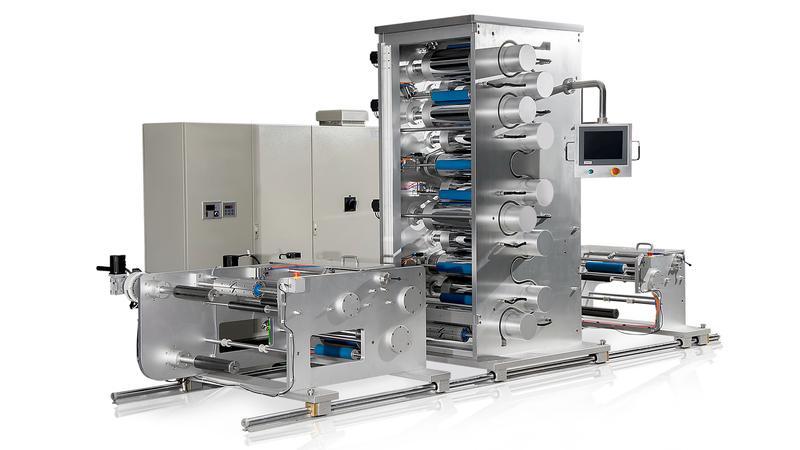 Through multi-axis synchronous technology, the speed of each roll is synchronized or proportioned running. A heating circulating system is set up inside the roll to warm its surface.Hard chrome plating on the roll surface. The hot stretching section consists of a moving stretching roll and a fixed stretching roll. Each roll is driven by a separate servo motor. Roll surface hard chrome plating treatment. The annealing section consists of several rollers, the number of rolls depends on the material and thickness. Each roll is driven by a separate servo motor. A heating circulating system is set up inside the roll to warm its surface. Roll surface hard chrome plating treatment. The cooling section consists of two rollers, each driven by a separate servo motor.A circulating system is set up inside the roll to allow water to cool its surface.Roll surface hard chrome plating treatment. The rewinding roller is driven by a separate motor, which covers the paper tube on the gas expansion shaft, and then fills the gas to make the paper tube close to the gas expansion shaft, so that the roller can drive the paper drum to rewind. Before testing, check that all MDO stretching machine test parameters are set or displayed correctly. 1.Switching on power supply, water source, air source, etc. 2.Prior to the first start of string operation, it is necessary to determine whether the motor steering is correct. If abnormal phenomena, such as abnormal sound, are found during operation, the machine must be stopped immediately and checked until the cause is found out and the test can be continued. It is recommended to set a low speed at the beginning, such as 10~15rpm, until the tension is stable, the speed can be increased. 8.The extruded film is pulled by copper rod as shown in figure 1.